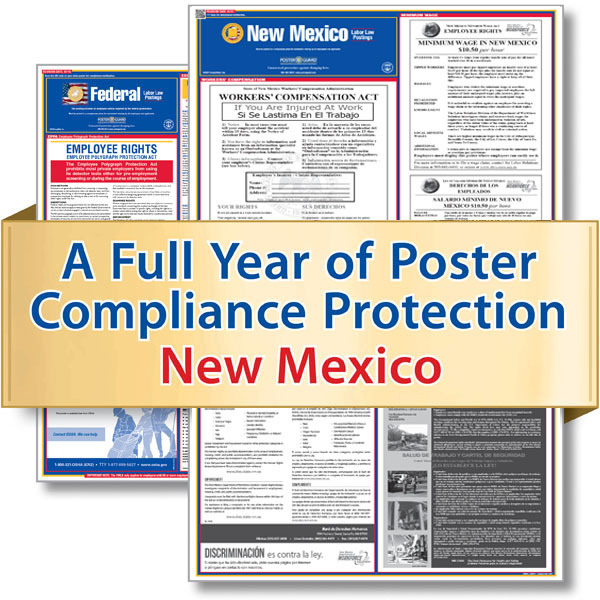 Poster Guard® Compliance Protection offers 365 days of hassle-free labor law posting compliance. We get your business up to date with all required federal, New Mexico state and local* labor law postings for general-industry compliance, and then we keep it that way. Guaranteed. It’s that simple. 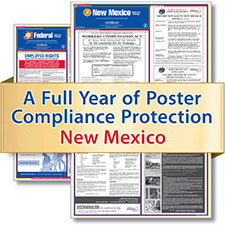 You enroll and we immediately send you a complete, up-to-date federal, New Mexico state and local (if applicable) poster set. The New Mexico Workers’ Compensation poster has been updated to reflect a web address change for obtaining assistance from the New Mexico Workers’ Compensation Administration. The New Mexico Workers’ Compensation poster has been updated to reflect a web address change to the New Mexico Workers’ Compensation Administration. The New Mexico Minimum Wage poster has been updated with new guidelines on overtime pay for airline employees. The poster was also updated with new enforcement remedies under the state's Minimum Wage Act. The New Mexico Fair Employment poster was updated to reflect an agency name change. The New Mexico Department of Labor was renamed to the New Mexico Department of Workforce Solutions. State Poster Size - 24" x 34"